Traveling on North Texas toll roads is more rewarding than ever! Earn great deals and rewards just for driving NTTA toll roads! TollPerks is NTTA's way of saying Thank you! Activate your account today to enter the sweepstakes. Play Scratch and Win for additional entries. With TollPerks, you’re never far from your next reward. Activate Your Account to Win! 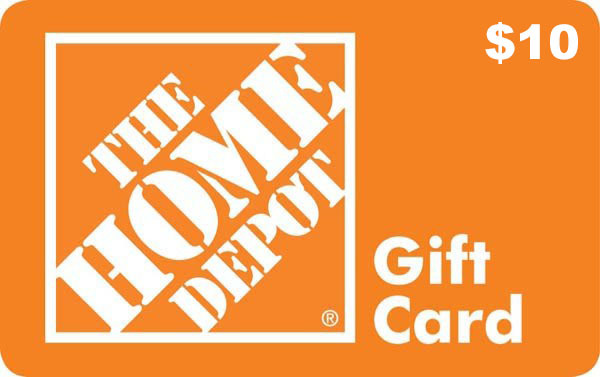 Enjoy a Home Depot $10 gift card on us. Be one of the first 500 new members to activate and receive confirmation of your TollPerks account, and you will receive a $10 Home Depot digital gift card! 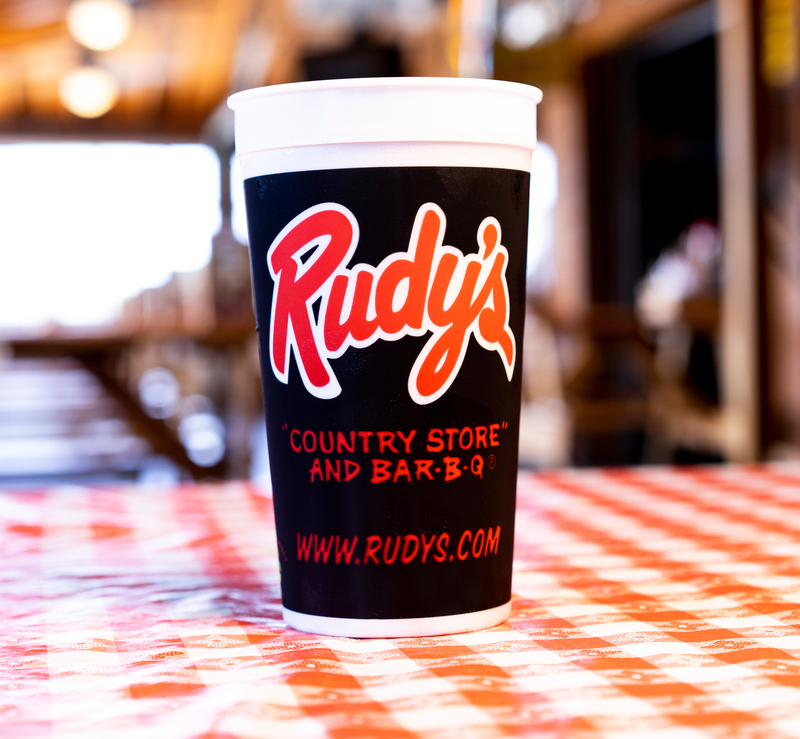 Special Deals from our Featured Local Partners. Don't have a TollTag yet? Already have a TollPerks Rewards account? Sign in here with the email address you registered with. Activate your account today for automatic sweepstakes entries! Play Scratch and Win for additional entries! TollPerks is a rewards program. It is designed to be a simple way of thanking NTTA customers for helping create Dallas' world-class road system and for patronizing NTTA's toll roads. 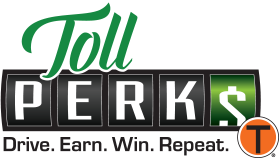 TollTag customers enroll in the TollPerks program and are rewarded with points for using NTTA toll roads. 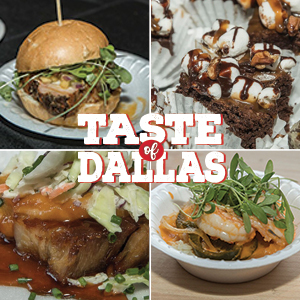 These points can be redeemed for exclusive rewards from DFW merchants. As a TollPerks member, you earn points for activating a new TollPerks account and driving on NTTA toll roads. You earn 100 TollPerks for every dollar spent with your TollTag. You also receive an instant win promotion chance "token" for registering your account, and for every month your account is in good standing. You also receive member benefits and exclusive offers. Exclusive offers and promotions from selected merchants are available for you to "purchase" using your TollPerks points. Members can view all offers that are currently available for redemption in the online catalog. Member benefits are "offers" that don't require points to redeem. Exclusive offers and promotions are vouchers that require points to redeem. All individual NTTA TollTag account holders with an active account in good standing can participate in the program. If your account is not in good standing, you can still accumulate perks (provided your account was in good standing when you signed up for TollPerks); however, you cannot redeem perks until your account is restored to good standing. Eligible consumers must be 18, a resident of Texas, and cannot be a NTTA employee. Also, NTTA reserves the right to limit or suspend points associated with any account that is not restored to good standing within a reasonable period, as determined by NTTA. Other restrictions may apply; see Program Terms and Conditions for full details. 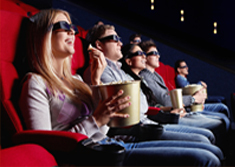 As a TollPerks member, you can participate in quarterly sweepstakes and mobile-friendly instant prize games. You will receive tokens by registering your account. You can use these tokens to participate in the quarterly sweepstakes and instant prize drawings. When a token is used, you will be notified of the result. 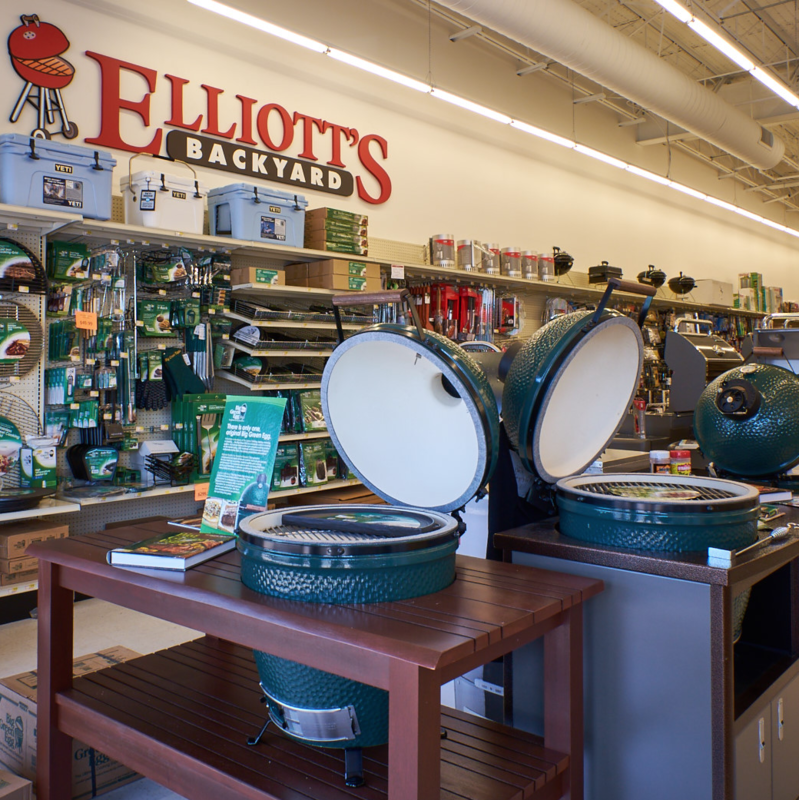 If you are a winner, you will be prompted to complete the checkout process for the item you won. We will ship it to you. How do I enroll in the TollPerks Program? First, you must be a TollTag customer with an account in good standing. Use the "Forgotten Password" link on the sign-in page. Your username is the email address you registered with TollPerks. What do I do if I don't receive the email address confirmation after submitting my name and TollTag account information? If you do not receive the confirmation email, please check your "Spam" folder. If you don't locate the email there, please use the help form to contact TollPerks. What do I do if my account is denied? If you receive an email from the support team containing the reason for your account being denied, you will need to resubmit your TollPerks registration information. If the reason listed for denial of registration is related to your TollTag account, contact NTTA customer service at 972-818-6882 to update or correct your account before attempting to resubmit your TollPerks registration. Why was my TollPerks registration denied? To confirm your account, the first and last name of the account holder of the TollTag account number must match what was submitted during registration. If you do not know your TollTag account information, you can find your account number and the name attached to it on your statement and in the online customer service center. Here's how to get access to your TollTag account online. 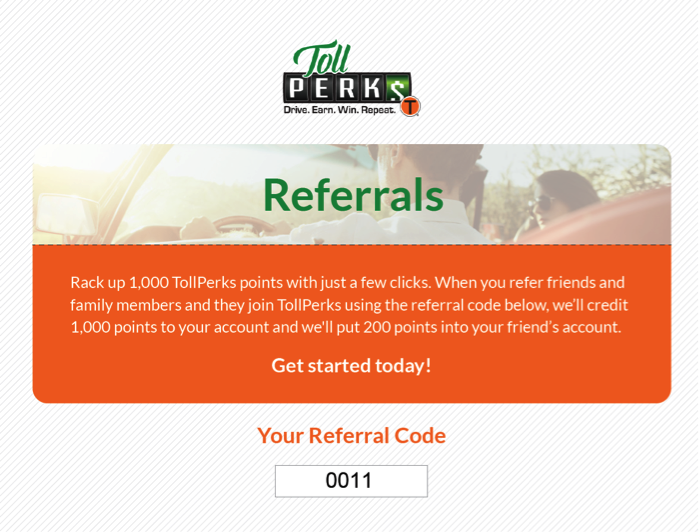 TollPerks members will receive 1,000 bonus points for referring someone to the TollPerks program. The person they refer will receive 200 points. Each person will receive their points after the new TollPerks member's account has been confirmed, which takes 48-72 hours. 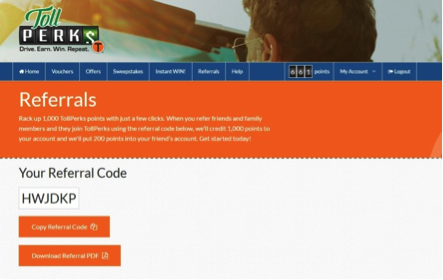 TollPerks members who want to earn points for referring a new member can log into their TollPerks account, click "Referral" on the blue menu bar, and copy the code from "Your Referral Code." Members can then share the code with the person they are referring, or they can click "Download Referral PDF" button to download the code and email it to their contact. Where does the new subscriber enter their referral code when they're enrolling in TollPerks? 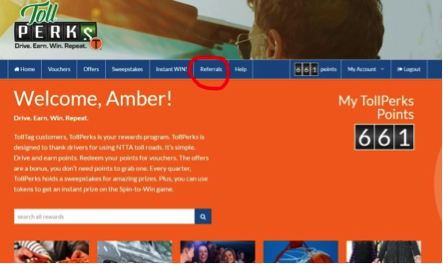 When new members register for the TollPerks program, they click the "Register TollPerks Account" button on www.tollperks.com, which takes them to the registration page. The new member then completes the form to create an account and clicks "Register Account." New members enter their referral code in the Referral Code field on this page. The new member and the referring member receive points once the new account has been confirmed. How long does it take to for the new customer to receive the 200 bonus points? Both new and current members will receive points after the new TollPerks member's account has been confirmed, which takes 48-72 hours. What if the existing member did not receive their bonus points within 72 hours, or the new member did not receive bonus points? If it has been more than 72 hours, and they have not received bonus TollPerks points, tell them to submit a help request ticket by clicking on "Help" on the blue menu bar on the website. The help request is located on the left side of the page. The customer should select "other" and enter the relevant information. How does a customer send someone a referral code? 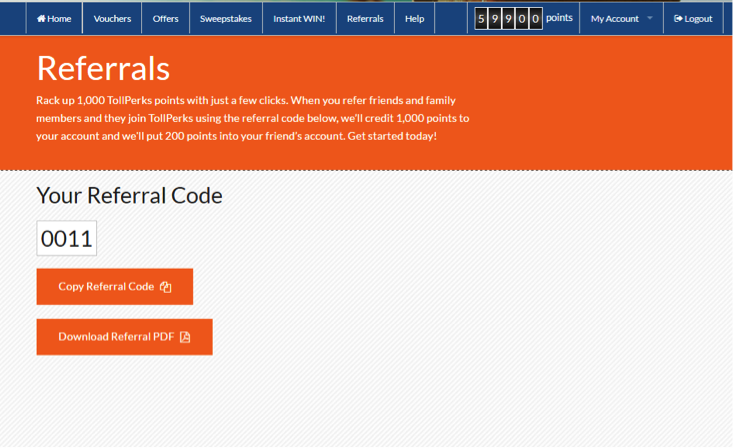 Log into the TollPerks account, then click on "Referral" on the blue menu bar. 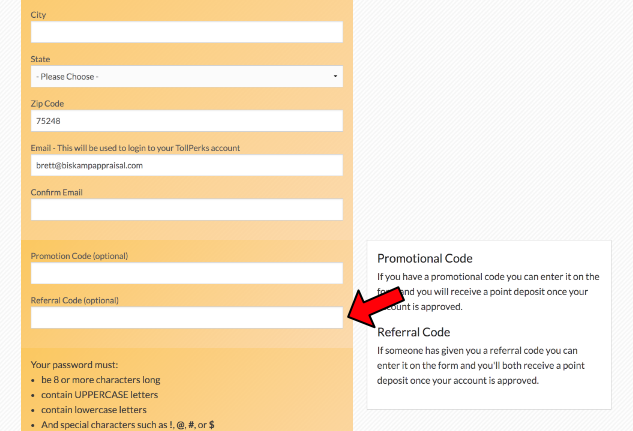 Copy the referral code that appears and share it with the person who is now joining, or click on the "Download Referral PDF" button to download the code and email it. What if an existing member doesn't receive a referral code? If they don't see a referral code, have them submit a help request ticket by clicking on "Help" on the blue menu bar. This is located on the left side of the page. The customer should select "other" and enter the relevant information. What if a new member entered the referral code that someone sent them, but after clicking the "Register Account" button they received a message that the referral code is invalid. First, recheck that they entered the correct referral code. If they entered the correct referral code and still receive the error message, have the customer submit a help request ticket by clicking on "Help" on the blue menu bar located on the left side of the page. Select "other", and then "I am missing TollPerks points." Enter the information, then click the "Enter Help Request" button. What if the person lost the referral code sent to them? The referring member will need to complete the referral process again. Is there a limit on the number of referrals a member can send? There is no limit on the number of referrals a customer can send.